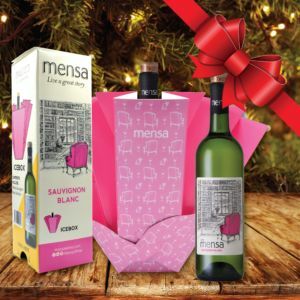 Mensa, the ultimate book club wine taking storytelling to the next level through digital innovation, has come up with a novel gift pack for the festive season that doubles up as a nifty ice bucket. The gift pack literally unfolds into a cooler making it ideal as a fun stocking filler or as a centre piece for sharing at the Christmas table. All you need to do is add the ice. Launched earlier this year as the first South African wine supported by an augmented reality (AR) wine app, Mensa has already been lauded for innovative design and packaging at the 2018 International Wine & Spirit Competition (IWSC) Design & Media Awards in London. The gift pack is available exclusively at Checkers stores countrywide at a festive price of R74.99. You will also find it at the Overhex Winery & Bistro if you are passing through Worcester over the holidays. For more information visit www.mensawines.com, or follow MensaWine on Facebook and Instagram, and @mensa_wine on Twitter.